So you’re thinking of mixing your own eliquids? 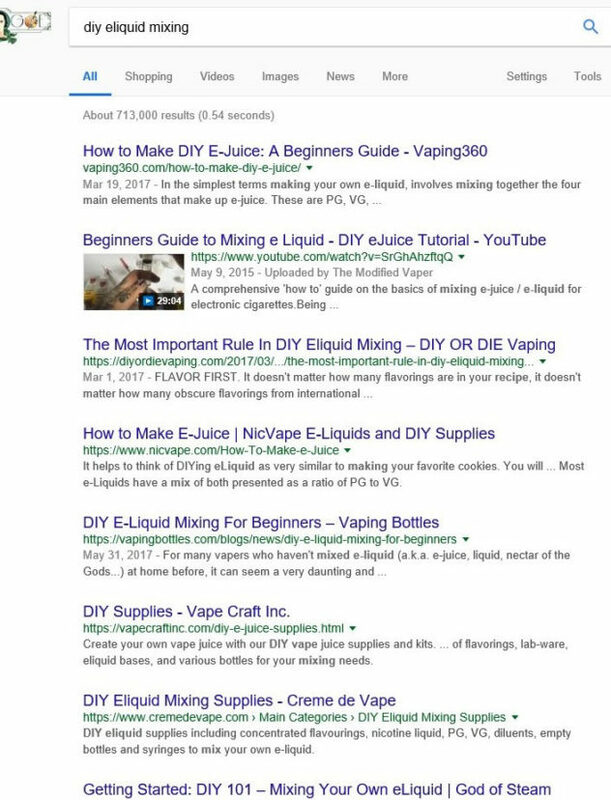 Whether it be to save money, make that perfect All-Day-Vape, or try to make a few bucks from recipe development for eliquid companies, it can be quite confusing given all the different sources of information and terminology mixers use. Where do you start? When I began thinking about mixing, I started like most everyone else,….. I Googled it. And that’s actually a good place to start. But with so much information out there, it can get overwhelming. What flavors do I buy first? Where do I get my PG, VG, and nicotine? Do I mix by weight or volume? 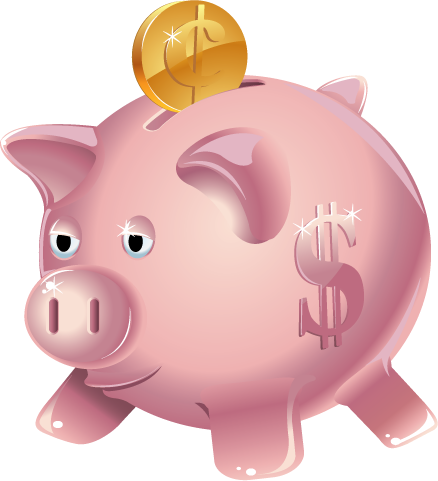 Where are the best deals on equipment? Oh, and by-the-way, how do I make a good recipe? These questions are what I would like to try and answer in a straight-forward, easily understandable way for you. I want to show you how easy it can be to make your own eliquid at a fraction of the cost and it be as good or better than costly eliquids. The beauty of mixing your own eliquid is, you can tailor the eliquid to suit your preferences. For instance, you’ve bought a “premium” eliquid for around $20 for 30ml. You like it, but it’s too sweet. 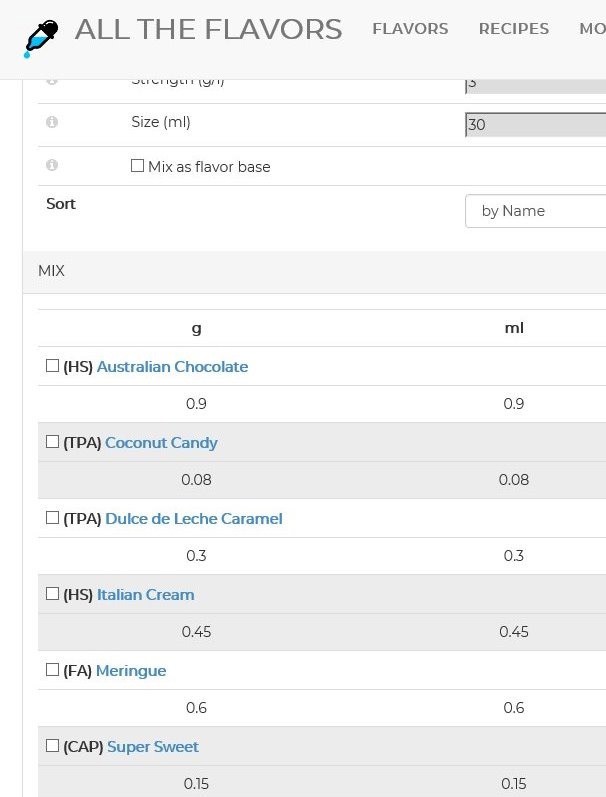 More than likely, someone has made a recipe that is close to that juice and posted it on Alltheflavors.com, or E-liquid-recipes.com. You can mix that recipe but just put less sweetener in the mix to fit your palate. I could go on and on about the benefits to mixing your own eliquid but lets get to some of these questions for now. This is the first in a series of articles I will be posting over the next few months explaining all the aspects of mixing I have learned, and by doing so, they may help you on your journey into beginning mixing. These first few articles will explain simple tips to getting started but as we go forward we will explore more in depth concepts into recipe development. Before we begin, please read Before You Start Mixing, and Getting Started. These articles will explain the basics on safety, PG/VG, nicotine, where to purchase flavorings and much more. Now let’s get to it! What Flavorings to Buy First and Why? One of the first questions I get from beginning mixers is, “What flavorings should I buy first?”. That’s a very good question and I wish I had had someone to ask that to when I started. 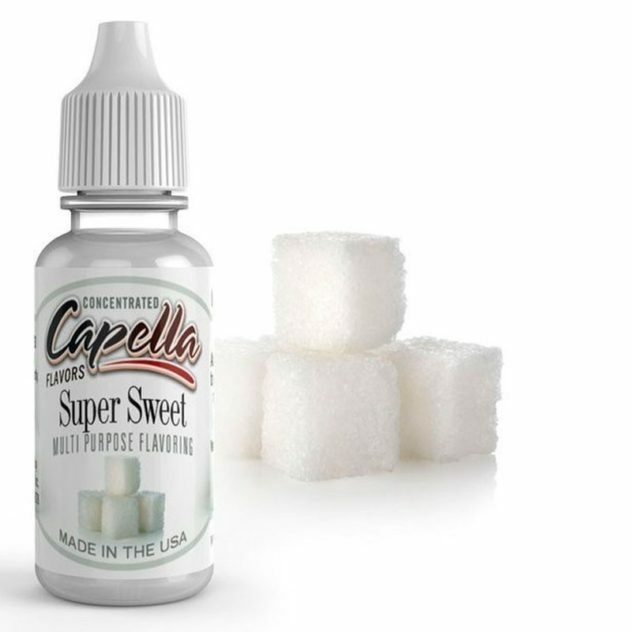 After I had a decent understanding of what the basic components of eliquid was, i.e., nicotine, VG, PG, and flavorings, I was ready to purchase some flavorings and get started. I went to an online flavor company and started picking out flavors I wanted, thinking they would be perfect for my recipes I wanted to make. Boy was I wrong. I neither knew what I was buying nor what percentages to use, I just guessed. And that was my first mistake. My recipes were horrible and it was fair to say that I was getting frustrated. Then I stumbled across a guy on YouTube that has been a great inspiration and teacher to me and many more; Wayne Walker of DIY OR DIE. Watching him mix and explain the process of mixing taught me to slow down, keep it simple, and have fun with it. One thing he explained was when starting mixing, don’t just go out and buy the flavors you think you need to make a recipe. Start with a recipe that’s already out there that has good reviews and high ratings and buy those flavorings for that recipe. Mix other mixers recipes that are proven to be good. a. You’re not wasting money on flavors you might not like. b. You’ll have great eliquid to vape. 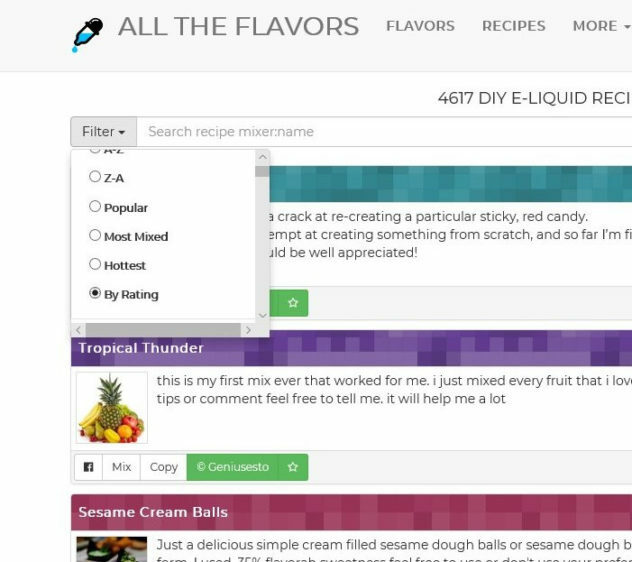 Then look at the recipes, examine how they are using the flavorings in their mixes. Try to identify all of the flavorings in their recipes. This will help you understand your flavorings better. Now I know some people will say,.. “NO!! !, You have to single test all your flavorings first!”. While that is absolutely key to developing your own complex, flavorful recipes, it’s not a good idea to jump right into that, unless you just enjoy writing notes and cataloging your flavorings. Most people see that as tedious work and find themselves overwhelmed with flavors to test. And when it gets overwhelming it’s not fun anymore. So, my suggestion is to find highly rated recipes, buy the flavorings for those recipes you think you might like and enjoy the fact that you’re saving money while vaping a delicious eliquid. Look at how the mixer is using the flavorings and the percentages to achieve the end result. Read their notes for the recipe. Try to identify each flavor in the mix and how they play on each other. Write a few notes on what you’re tasting. This will be more helpful than you realize. Remember…, take it slow, keep it simple, and have fun with it. The next article will talk about simple recipe development. This is the next step to understanding how to use your flavorings in a simple yet flavorful recipe.